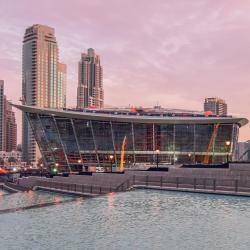 Looking for hotels near Dubai Mall? Towering high at 991 feet across 63 levels, Address Downtown is a veritable landmark of luxury, located in the very center of Downtown Dubai. 5* Gorgeous Two Bedroom Apartment is located right in the heart of Dubai, just a few steps from The Dubai Fountain and 1.3 miles from Burj Khalifa. Strategically placed between new and old Dubai, Rove Trade Center offers the perfect location for leisure and business guests alike. Perfect place to stay in Dubai. The room is clean and neat. The staff is friendly and helpful. Featuring an outdoor swimming pool and a sundeck, Rove Downtown Dubai is conveniently located in the heart of Downtown Dubai, adjacent to Burj Khalifa and The Dubai Mall. Walking distance to the Dubai Mall. Featuring panoramic views of Burj Khalifa, the luxurious Indian themed Taj Dubai is located in the heart of the business bay area just a stone’s throw away from the Dubai’s famed Downtown area and... The house keeping staff, the molton brown accessories and the view! 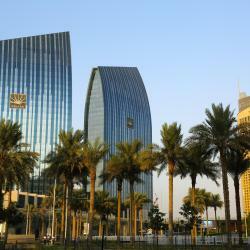 Located on bustling Sheikh Zayed Road, this hotel is minutes’ drive from Dubai Mall. The property offers unlimited access to Wild Wadi Waterpark™ and access to Jumeirah's Private Beach. I would like to thank Jalal at the receiption desk whom have showed great support and help for us. Boasting the title of the tallest hotel in the world, the 4 star Gevora hotel is located on Dubai’s Sheikh Zayed Road in the Trade Center Area of the city and is ideal for guests looking for an easy... The staff when I checked in was amazing. So polite and helpful. Set in Dubai, within 1.1 mi of The Dubai Fountain and 1.2 mi of Dubai Mall, Damac Maison Royale The Distinction offers accommodations with free WiFi. I got a complimentary upgrade to a deluxe suite. It was amazing. Located in Bay Square, a low-rise community just steps from downtown Dubai filled with shops, street side dining and businesses, DoubleTree by Hilton Dubai - Business Bay offers a quirky home to... The location and area at the back of the hotel, amazing. The hotel offers a unique and relaxed vibe among the metropolis of the city. The design, decoration and grandness of the place. Steigenberger Hotel Business Bay is a cosmopolitan 5-star hotel located in the heart of the Business Bay district in close proximity to the Burj Khalifa, Dubai Mall and the Dubai Downtown area, with... Very convenient location for me personally, as it's very close to my office. Located on Sheikh Zayed road in Dubai, Sheraton Grand Hotel is a stylish, nonsmoking hotel that offers picturesque views of Dubai skyline. Amazing hotel. Perfect location. Located in the heart of Downtown Dubai, connected to The Dubai Mall and 10 minutes away from City Walk, Sofitel Dubai Downtown is an beautiful oasis that blends urban sophistication with refined... Everything , location amazing , 15mnts walk to dubai mall inside metro tunnel . Hotels with great access to Dubai Mall! Centrally located along Sheikh Zayed Road, 10 minutes’ drive from Dubai Mall and Burj Khalifa, this 5-star Asian themed hotel features two swimming pools, an extensive health club and spa, free WiFi... Pretty much everything was incredible! Ideally located within the Business Bay district, the Gulf Court Hotel Business Bay provides an unrivaled accommodations choice for both business and leisure travelers seeking a memorable experience. Everything was good, definitely I will come back again. Located on the arterial Sheikh Zayed Road, the Habtoor Palace, LXR Hotels & Resorts offers grand accommodations in Al Habtoor City, Dubai’s first-ever integrated urban resort. Pizza at private dinning was delicious. The staff were so friendly and helpful. Mövenpick Hotel Apartments Downtown Dubai features accommodations with free WiFi in Downtown Dubai, 1.1 mi from The Dubai Fountain. The staff are amazing, super friendly and cooperative. Setting a benchmark for comfort and style in Dubai, soaring 1093 feet, 72 stories and the World’s third tallest hotel, Rose Rayhaan by Rotana located in a prime location of Sheikh Zayed Road, 3 mins... The location is excellent right next to the metro station. Spread across two iconic towers, the spectacular JW Marriott Marquis Hotel features an enticing array of 14 award-winning restaurants, bars and lounges and the sublime Saray Spa and Health Club. Being such a busy hotel i was amazed that they still maitained an excellent standard. The Dubai Mall isn’t just big, it’s the largest shopping centre in the world. So, even if you’re not out kit yourself out with a new wardrobe, you’ll be spoiled for choice with the selection of restaurants, cafes and entertainment. Amongst its vast area – equivalent to 50 football pitches – you’ll find an aquarium, a ‘Kidzania’ complex, the Sega Republic theme park and an Olympic-sized ice rink. Take a look at one of the many digital direction finding maps around the Mall. Then you can find what you're looking for and plan a route, as the Mall is very large and you can save yourself a lot of walking and tired feet! Shop around too. There's more than one of every type of shop or store. Dubai Mall would have been a mall much like other upscale malls if it hadn't been for the aquarium and the waterfall. The aquarium was nothing less than fabulous, and I will return just to see that if I get to Dubai again. The waterfall was also spectacular and mesmerizing. 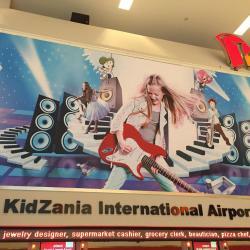 It was a huge mall and that was pretty exciting in itself, but many of the stores were international and could be found elsewhere, although their contents were often a bit more dazzling here. I just was in Singapore in August 2018. I just was in Singapore in August 2018. And if your say Crazy Rich Asians you can understand this statement , after seeing hundreds of luxury stores for which lists in the hundreds , Dubai was the same. inside in one building . Singapore has several 3 story Chanels, Hermes.. blah blah blah. Needs to much time to figure out, I suggest not to waste trying to shop. Rather visit Burj Khalifa, watch the fountains in the evening and explore the restaurants around the fountains. Try visiting The Palace for a meal. People are talking about Dubai Mall! Explore guest hotel reviews featuring "Dubai Mall"
Perfect location, Beeeeeeeeautiful 2 bedroom, kitchen very well equipped with all utensils,oven. Microwave,4 plate electric heater, Good quality Washing machine. Dining room with nice table. Wonderful swimming pool. Free bus for Dubai Mall and Beach and Burn Khalifa 4 times a day. All all all wonderful in this hotel. Great Location! 10 minutes walking distance from Dubai Mall. 2 minutes away from a 24/7 supermarket. A lot of nearby restaurants. Sound proof apartment. Loved the king size bed! Microwave and washing machine was a good plus to the appartment. Hotel staff were friendly and accommodating. The view from our room was incredible, and the amenities were just what we needed for our stay. The location by the Dubai Mall was optimal. 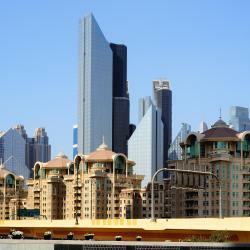 Very close to the mall and convenient shuttle from hotel every hour to the Dubai mall. The staff are kind and extremely helpful. The staff were very friendly and helpful. The hotel is in walking distance from Dubai mall. The facility is very neat and clean. Allow yourself 3 full days to get around Dubai Mall - never been to a mall so big before. From aquariums to dinosaur skeletons Dubai really has it all. Avoid hotel restaurants if you can do without the Alcohol. Food quality and value is better. Alcohol is available in venues attached to hotels only and carry hefty services charges and premiums. Some local options provide a better more cultural experience and value for money. For example, go to Ravi Indian Restaurant if you like Indian. Go to Istanbul Flower on Sheikh Zayed (Next to Safestway) for best Turkish (Try Iskender). Al Hallab for best Lebanese food (Emirates and Dubai Mall or original on Al Garhoud Road). Another good Lebanese option is Al Safadi on Al-Rigga Road in Deira). For best steaks I recommend the JW Mariott in Deira. For good Asian go to Wagamama. For Persian Food go to Sadaf on Sheikh Zayed or in Deira. Dubai Mall is like 3 main streets put one on top of the other. YES!! Make sure you reserve for places like Em Sherif at Dubai Mall and book a table at Le Petite Maison.